UV Rays: What’s The Difference Between UVA and UVB? Having red hair makes your responsibility of wearing sun protection much higher than others’. But all of those different terms, such as UVA and UVB, can be confusing, so here’s some information on what UVA and UVB means, and why it’s crucial for everyone, especially redheads, to wear SPF that protects you from both. Sunlight is made up of two types of harmful rays: ultraviolet A (UVA) is long wave, and ultraviolet B (UVB) is short wave. 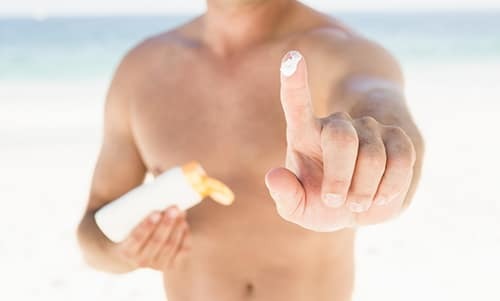 When your skin is exposed to sunlight, both types of ‘waves’ or rays penetrate your skin and contribute to permanent skin aging, damage and potentially skin cancer. UVA rays account for up to 95% of the total UV radiation that hits Earth, and have a wavelength of 320-400 nm. This is considered a long wavelength, penetrating your skin extremely deeply in skin cells called keratinocytes in the basal layer of the epidermis, where most skin cancers occur. UVA is the dominant tanning (or in most redheads’ cases, freckle-forming and burning) ray and is the primary ray used in tanning booths, which can be up to 12 times stronger than the sun. Although UVA rays penetrate deeply, they are less intense than UVB rays, but they are 30-50 times more common than UVB, present during all daylight hours whether summer or winter, and can penetrate clouds and glass. 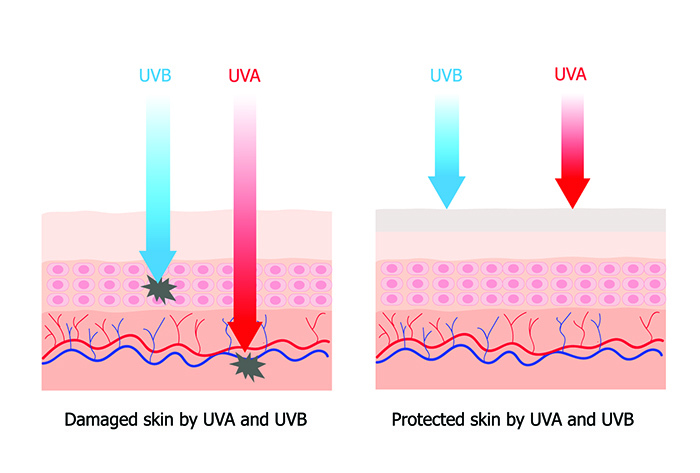 UVB rays account for (most of) the remaining 5% of UV radiation and have a wavelength of 290-320nm. The shorter wavelength means that it is most damaging to the epidermal and superficial layers that are close to the skin’s surface, making it the main cause of skin reddening and sunburn. UVB also contributes to tanning, if you’re that way inclined. Unlike UVA rays, UVB rays do not significantly penetrate glass/clouds, and the intensity varies according to location and time of day and year. Also, they’re especially dangerous at high altitudes and on reflective surfaces such as snow or ice, bouncing up to 80% of the rays back so that they hit the skin twice! The moral of the story? Always make sure you wear some form of sun protection if you plan to spend time outdoors. Whether cloudy, sunny, snowy, or behind a window, now you know the importance of wearing SPF, and making sure that your sunscreen provides protection from both UVA and UVB rays.